We moved to a new house a few days ago. Actually, just down the road. Everything had to be packed anyway, no matter how far the truck was going in the end. I was trying not to buy anything unnecessary in the days before the move. Even food. However, we still had to eat. What could be better than a cake with only three ingredients? I had a couple of half empty honey jars in the pantry, so they had to be used up before the move. The rest is simple and straightforward: freshly ground toasted almonds combined with the honey and held together by a few egg whites (these also needed to be cleared from the fridge before the move). That's all it takes. The result: the most delicious nut cake I had in a long time. Honey and nuts are a match made in heaven. 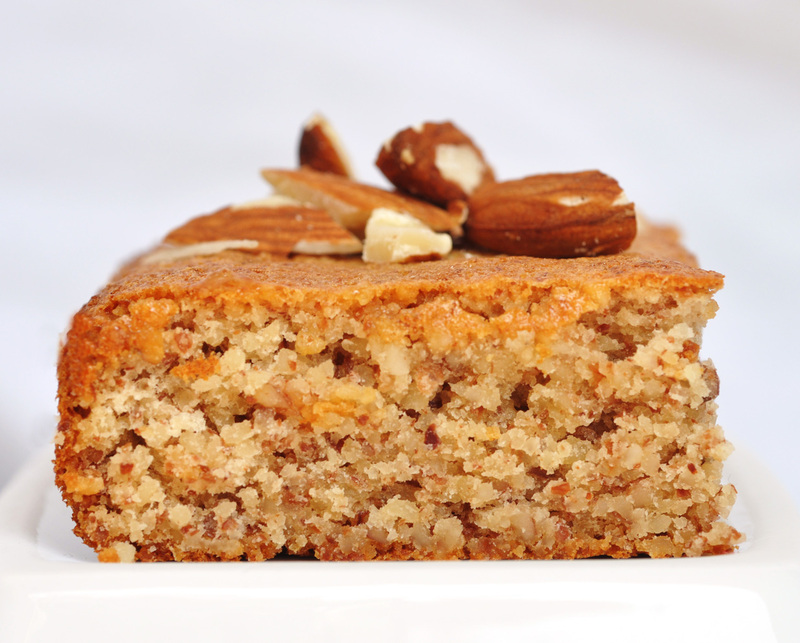 Honey and nuts is all you taste in this cake. Gluten free, no added sugar and simply yummy at the same time! Preheat oven to 175C (350F). Grease or line the bottom of a wide loaf tin with parchment paper. Process toasted whole almonds in a food processor until finely ground. It will make about 1 1/4 cups ground almonds. Combine ground almonds with honey until it has become a thick paste. Set aside. Beat the egg whites with the salt until stiff enough to hold peaks. . Gently fold the egg white into the almond honey mixture. Then transfer to prepared loaf tin. Sprinkle batter with sliced almonds. Bake for 20-25 minutes, until cake has turned golden brown and inserted toothpick comes out clean. Let cool in the tin for 10 minutes. Let cool completely on wire racks. Cut into bars or squares.